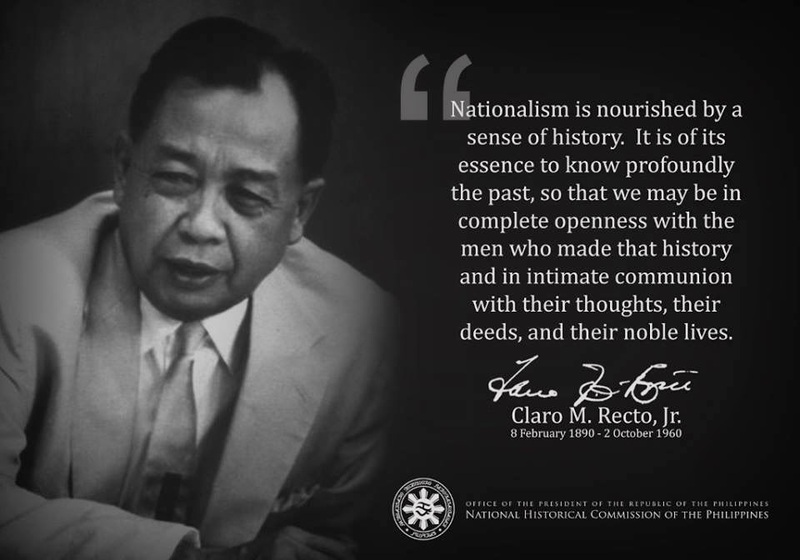 WHAT WE FILIPINOS SHOULD KNOW: Any truly nationalistic leadership and people will be faced with serious (sometimes laughable, but still serious) threats inside and outside their country. Being pro-poor is not acceptable to existing US foreign policy, which under the mythical proclamation of fighting for democracy and freedom, is in reality geared primarily to support the objectives of American transnational corporations. REV. PAT ROBERTSON: There was a popular coup that overthrew him [Chavez]. And what did the United States State Department do about it? Virtually nothing. And as a result, within about 48 hours that coup was broken; Chavez was back in power, but we had a chance to move in. He has destroyed the Venezuelan economy, and he's going to make that a launching pad for communist infiltration and Muslim extremism all over the continent. You know, I don't know about this doctrine of assassination, but if he thinks we're trying to assassinate him, I think that we really ought to go ahead and do it. It's a whole lot cheaper than starting a war. And I don't think any oil shipments will stop. But this man is a terrific danger and the United ... This is in our sphere of influence, so we can't let this happen. We have the Monroe Doctrine, we have other doctrines that we have announced. And without question, this is a dangerous enemy to our south, controlling a huge pool of oil, that could hurt us very badly. We have the ability to take him out, and I think the time has come that we exercise that ability. We don't need another $200 billion war to get rid of one, you know, strong-arm dictator. It's a whole lot easier to have some of the covert operatives do the job and then get it over with. This article is excerpted from Understanding the Venezuelan Revolution: Hugo Chávez Talks to Marta Harnecker to be published by Monthly Review Press in September. The book covers a wide range of topics, including Chávez’s political formation, the transformation currently taking place in Venezuela, and its place in the global context. In what follows, Chávez recounts the events of the failed coup d’etat of April 11, 2002.—Eds. Marta Harnecker (MH): Since we are doing this interview in the same place that you were detained during the April 11 coup, could you tell me your strongest memories of those bitter hours? Hugo Chávez (HC): We initially thought we would have several alternatives, including moving to Maracay, but the tanks I had sent for earlier, [that were] needed to make that move...had been sent to Fort Tiuna instead [under pressure from the generals supporting the coup]. That made our move to Maracay impossible. After consulting with some of my people, I finally decided to accept [the pro-coup generals’] demand to hand myself in. I gave Giordani and Navarro hugs and I said goodbye to my dispatch, saying, “The strategic window has closed.” They did not respond. I thought I was going to die. That ominous feeling crossed my mind for a few moments. I said goodbye to everyone who was with me there in the palace. I went to Fort Tiuna with Generals [Manuel Antonio] Rosendo, [Ismael] Hurtado, and a few others that I chose. I did not go as a prisoner. It was only when I entered the building under the command of the general of the army that I became a prisoner of the coup-mongering generals. MH: I also thought they were going to kill you. I still don’t understand why they didn’t. HC: They gave the order to kill me, but what happened was the mutinous generals did not have a true leader and some of them, especially the younger officers who were in charge of me, blocked that order. All the lower-ranking people who were around me at each of the various places they had me detained—soldiers and officers alike—went way out of their way to help me out, to clean the room, the modest bathroom. There was a really small bed and they found a better one, and brought a chair. They would offer me sodas, or coffee. They really went out of their way. When they let me out to take a quick jog, they brought me a T-shirt and they got me some sandals to wear outside. They were ready to help me with whatever little thing I might need. There were also the two female military prosecutors. These women came into my room by themselves at first, but right after they arrived, they were ordered out and a few minutes later they came back with a colonel from the coup who was a lawyer, and they sat down. So I figured out they had ordered the women out because that officer wanted to be there. Then there is the help I received from the soldier who gave me a rock to pray with. This man was a patriot, in his own way. And the lieutenant who came to Turiamo and told me: “Don’t worry, you are our president, don’t worry because later tonight we are going to capture the higher officials and get you out of here.” There was another guy who showed up once in a while where they had me detained and took notes I wrote out in the garbage, gave them to his wife who made lots of copies, and distributed them showing people that I had not resigned. All those were a help, one drop after the other. I will never forget those guys, those days. Being here on Orchid Island today makes me remember two things: one good and one bad. The good memory is I was here during Semana Santa [Holy Week] swimming with my daughter Rosa Inés, with María Isabel [then Chávez’s wife], and the boy Raúl. I escaped and we had a really nice time. The bad one is that night when I was held prisoner here. Then the coup conspirators sent me a special group of emissaries: a general from Military Justice, a colonel from the coup conspirators, and the archbishop. I was in the little room and was already processing scenarios in my mind about what this group would want with me. I wanted to play for time more than anything else, to try to figure out what was happening in the country. I had allowed them to take me to the island because I know the island—I knew that, in spite of the fact that it was an island, I would have opportunities to get access to information. I even thought if the situation wasn’t changing, they were coming to offer me safe passage out of the country and that maybe I should accept, without resigning, the idea of going to a friendly country and then organizing an international action. I told them I could not sign it, that they knew I had been willing to sign under a series of conditions, and I repeated the conditions that I had put forward at the palace. I knew they couldn’t give them to me. I told them that the first one was the physical safety of all the people in the country and the government: “You have violated that condition, you have detained people, beat them up, who knows all that is happening now,” but while I was at Fort Tiuna, I saw that they had taken Tarek [Tarek Williams, now governor of Anzoategui State] prisoner, and also another representative, they had been dragged out of their houses, arrested. “Second: that they respect the constitution, that is, if I resign, it must be before the National Assembly, and the vice president assumes the presidency, until they can call new elections. And you guys cancelled the constitution, dissolved the National Assembly, the Supreme Court, and so forth. So what are we really talking about here? MH: And you knew about all that? And fourth: that all my government aides be allowed to come with me, those folks who were with me for years. They were not going to accept that either because that was my support in the whole process. And the archbishop said: “OK, Chávez, you have to think about the country,” you know, with that rhetoric...“I am thinking about the country.” We started to argue, and I was buying time the whole while. I saw the sergeants who were there with their rifles and light missiles, talking to each other and looking at me as well; there was a kind of tension in the air. And outside, the admiral who had brought me here was making calls, going in and out. I could tell something was happening, something bigger than the lie about the resignation. Then I called the general in charge of the paratroopers in Maracay, which had been the bastion of resistance. I spoke with Baduel, and with Garcia Montoya who were there at the command center. They explained a few things, but there was no time because the helicopters were already landing. There was no problem, and a few lawyers and doctors came to check up on me because there had been rumors that I had been beaten while in custody, and people had been worried about that. Well, I think it was at about this time of the morning when they showed up (he looks at his watch and it is around 2:30 a.m.) because I got to the palace around 4 a.m. So that is why I told you I would remember this place for the rest of my life. When I reflect on the April 11 coup, I remember the citation I mentioned earlier from JFK: “Those who make peaceful revolution impossible will make violent revolution inevitable.” We chose to make our revolution constitutionally, through a constitutional process of unquestionable legitimacy. If at some point on April 11 or 12 I doubted that a democratic and peaceful revolution was possible, what happened on April 13 and 14—when an immense number of people came out into the streets, surrounding Miraflores and several army barracks, to demand my return—strongly reaffirmed my belief in that kind of revolution. Of course the battles are long and hard—we are talking about the art of making possible what appeared to many to be impossible. Nuncio Berlocco went on to say that in Venezuela the Catholic church is not aligned with any political party and that the Church and government ought to work together, as there are many points of agreement between the two, such as on the issue of attending to the needs of the poor. “The Church is in favor of the people and I believe that there are many areas of agreement [with the government]. There is no need to put the relationship in terms of confrontation,” said Berlocco. Relations between the government and the upper levels of the Catholic Church hierarchy have been tense ever since Chavez was first elected in 1998. High level Church officials have always been very critical of Chavez, partly for the reduction of public funds for private schools, which affected Catholic schools, and partly for ideological reasons. During the April 2002 coup attempt, the Catholic Church’s highest representative, Cardinal Ignacio Velasco was deeply involved in the coup and was the main person who tried to persuade Chavez to sign a resignation letter while rebelling military officers detained him.